They walked along a familiar road surrounded by forests on either side. Illuminated by the starlit sky, the road brought back memories. For here was the place where they had first met each other and the misunderstandings between them had begun. They became bound by a relationship of butler and lady after the former rescued the latter from being kidnapped and driven away along the road that they were presently walking on. With their entwined fingers and beating hearts, they walked along, while sneaking glances at each other every now and then. They found a bench on the pavement after a few minutes and taking a quick look at each other at the same time, they went towards that bench. Settling down, they gazed up at the sky with smiles on their faces. “Don't feel bad for lack of shooting stars during the day, Hayate. We have our old friend, the sun, and it always reminds us of it's presence, by shooting down it's rays, wanted or unwanted. “And why do you seem so interested in stars today?” Nagi seemed a little agitated for,as much engrossed as she was in the night sky, tonight was Christmas Eve, the special day when she got reunited with Hayate after two years. She wanted Hayate to talk about the same thing that she desperately wanted to be discussed. “Yes. I've been following you around,” said Hayate, still gazing up at the sky. “I know each and every detail of what you've been up to. You've been working hard.” He looked at her and smiled. “Yeah well, Chiharu definitely is fun to stay with. And yeah, although I am lonely at school, I sit by the window everyday and there's this tree with a weird branch that often moves up and down whether there is wind or not. It's fun to watch. And there's this eagle with gigantic eyes that always sits on that branch and stares at me. Sometimes I feel…” Nagi stopped short. Nagi clenched her right fist. “You... You've been stalking me even at school? How could you Hayate? How could you? This is really horrible. I never expected….I know you've been following me, I've known for a long time, but I never thought you had gone to such an extent.” She teared up out of embarrassment and clenched her fist harder. Hayate moved forward, took her hand and loosened her clench. Nagi looked away and tried to fight back her tears. “Is it because you didn’t want me to know?” he asked. Nagi stared at the ground without blinking. Her bangs fell upon her eyes and she felt relieved that Hayate couldn't see her tears. Hayate wanted to move her hair away from her face but Nagi needed something more impactful. “Tell me Nagi.” It was the first time after 2 years that he had uttered her name. Nagi nodded while still looking down on the ground. They were quiet for a few minutes after that. This time Nagi broke the silence. “I really wanted to grow up as a normal responsible adult. Never knew taking up responsibilities could be so difficult. I'm fortunate that Isumi and Saku help me out whenever I desperately need help. I'm glad Tama and Shiranui are staying with them. I don't need to be worried as long as they're with them. I know they'll do a better job of keeping them safe than I can. Hinagiku and I meet up sometimes to discuss our studies. She keeps me updated about the new things that she's learning and she helps me out on mine. She also helps me out on my lacrosse skills. It's just…” Nagi faltered. She glanced at him from the corner of her eyes and gazed in front of her. Hayate was impassive but she could tell that he wanted her to continue. Hayate didn't say anything but his eyes were fixed on her. Hayate continued to stare at her. “Then why didn't you?”said Hayate. Nagi remained silent. 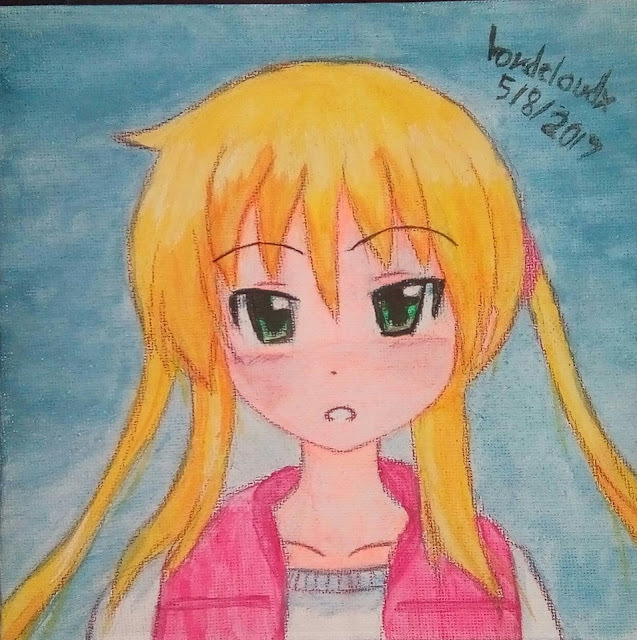 Deep within, she felt a sense of relief by his words but she decided that she would let Hayate speak and not reveal any more of her emotions until she was satisfied with what Hayate had to say about himself. Hayate wondered if Nagi had become upset again. He became curious about her thoughts but her silence made it awkward for him to speak. He realised that she felt vulnerable speaking only about herself while he kept on listening and hardly saying anything. He decided to convey to Nagi, more of what he felt, if that would ease her a bit. “Wh-what do you mean?” said Hayate, blushing slightly. “Wouldn't it have been easier for you to kidnap me if I just fell sick and too weak to move?” said Nagi. Hayate turned crimson. He hadn't​ expected the conversation to turn this way and he wasn't prepared. “Oh come on,” said Nagi. “That's different. You kept a girl waiting, you know. So you better make up for the lost time.” She was enjoying his puzzled expression. “Eh?” Nagi realised she should've thought about it a little before mentioning it. But the mere anticipation of meeting Hayate had been too much for her and she couldn't plan everything out. Hayate looked at Nagi and smiled. She didn't have any ideas but didn't want Hayate to know that. She blushed furiously but kept her gaze fixed on Hayate for she was afraid that turning her head or averting her gaze would make her thoughts transparent. Unfortunately for her, Hayate figured it out but it made him want to tease her more. Nagi was at a loss for words. The truth was, being with Hayate alone was enough for her. She wanted to tease Hayate and make him embarrassed but her lack of ideas was really turning against her. Hayate didn't respond. He was silent. Her words made him think of bizarre ideas. It was a snowy night, the two of them were alone in the park and Nagi was looking really endearing in her red winter vest and with her bangs covering her forehead. He realised that their fingers were still entwined. He moved forward, lifted his left hand and brushed her bangs away from her eyes. Nagi was at a loss for words. She wasn't sure where the conversation was heading but she decided to play along anyway. “Why? You're not thinking of doing anything unnatural, are you?” she said. “What do you want me to do, Nagi?” asked Hayate. Nagi was shocked by this turn of the conversation. But she didn't want to stop. “What you're about to do next,” she said. “Listen,” she heard Hayate saying. Nagi couldn't hear a sound. The leaves weren't rustling, there was no chirping of any bird, no splashing of water nearby. Only silence surrounded them. “I can hear nothing,” said Nagi. Nagi kept her eyes shut tight, but she could feel her heart beating fast. Hayate looked closely at Nagi. With her enclosed eyes and the moonlight falling upon her face, she looked like a painting. He touched her right cheek and felt her tremble under his fingers. Consumed by the smell of lavender shampoo on her hair, he bent down and his lips descended on hers. The moment felt surreal for both. It was a mere touch, nothing more than that, but they felt more real than they had ever felt before. Nagi had never thought that Hayate would actually kiss her. And she was glad he did. And so was he. That was the eternal moment for both of them. They remained still for a while, with fear in their hearts for what would happen next, as well as happiness that they wished would last forever. And then, finally, Nagi broke the kiss. She moved away, red in the face, confused, yet, with an overwhelming happiness. She wondered why Hayate had kissed her but she was too embarrassed to even look at him. That was her first kiss and although she had enjoyed it, she didn't know why it happened. She didn't know Hayate's intention behind it and she didn't want to ask. Hayate looked for a while at Nagi, who was sitting with her back turned towards him, and he wondered whether he had done something wrong. He knew that he was truly living in the moment and he could tell that she was, too. He couldn't prolong the silence between them as that would only intensify the awkwardness. “Are you okay, Nagi?” he asked. Hayate felt a rush of mixed emotions. He was surprised, but joy and relief were what dominated his heart at the moment. Hayate pulled Nagi closer to him as she turned away. Hayate smiled. “Then why don't you find out?” he said. Nagi’s eyes widened in disbelief. She didn't know how exactly she was supposed to act. She looked at him sitting straight, eyes closed, his bangs moving with the gust of wind. She leaned up towards him and touched his face. In a moment she kissed him just like he had kissed her and felt hayate's arm around her waist. She moved her arm up and around Hayate's neck and once again they remained still, now locked in an embrace. Hayate could feel the soft touch of Nagi's hair on his face and he knew he loved her, he had loved her for a long time and he knew that her feelings for her had remained constant. He didn't want to let her go anymore. Nagi broke the kiss again but she knew that she wasn't done yet. As Hayate opened his eyes slowly, she quickly withdrew her hand from his neck and covered his eyes. She leaned in and traced her tongue along his lips and felt him quiver. She smiled for a while, but shocked at her own boldness, she immediately broke their embrace and moved away. “What do you mean that's it?” asked Nagi. “Well I thought it'll last a bit longer,” said Hayate. He sounded slightly disappointed. They were quiet for a while. After that, Nagi spoke first. “Hayate,” she said. Hayate was stumped for a while. He hadn't realised that he had missed out on giving that information. Hayate bent down his head. “What do you think?” said Hayate. “I think not,” said Nagi. 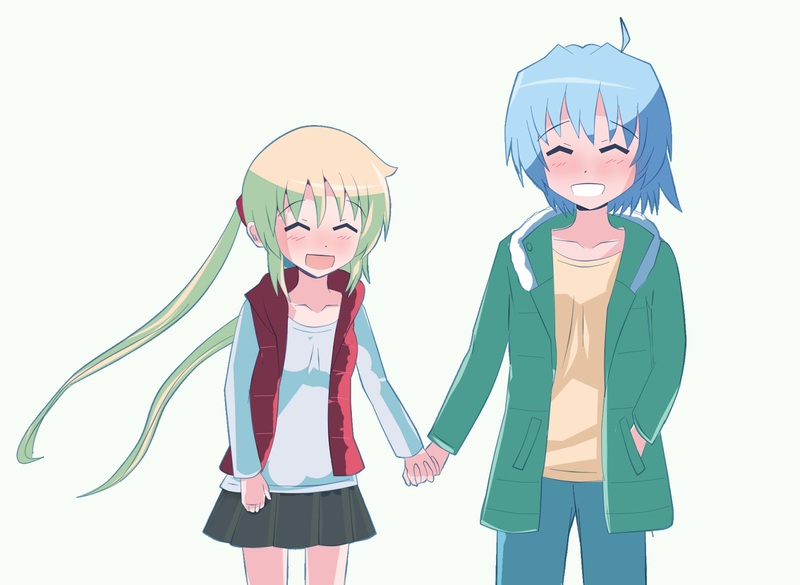 Hayate smiled. “You think right,” he said. herself with a surprised Hayate. “To commemorate our first Christmas Eve after 2 years,” she said. “Eh? How did that much time pass?” said Nagi. “Merry Christmas Nagi,” said Hayate. Smiling, the two of them walked away, with stronger feelings in their hearts and they were surer of those feelings than they had ever been. Author's Notes- Thank you for reading this fanfiction of mine. It's my first fanfiction and I'm very happy with the result. I'd like to thank lordcloudx for encouraging me while I was writing and giving me the necessary feedback. I wanted Hayate and Nagi to be completely alone on this starry night with no one but themselves dominating their thoughts. I imagine them to interact exactly like they do, in this fanfic - after two years; no drastic change in their personalities but a major change in their relationship and in each of their perceptions of the other. I think this fanfic is very true to Hata's original intent. It just fits so naturally in with the series that it's as if it was written by the original author of Hayate. I love the subtle references to the little things in this story -- because as we've found out by chapter 568, it's those little things that really lead up to the big finale. People nowadays are so visceral and look for instant gratification or confirmation of something made overt or plainly obvious -- and when subtle hints are left behind, they like to pretend that these hints were never there in the first place. Unfortunately, Hata's style of storytelling doesn't cater to visceral, what you see is what you get type of readers -- but if you are looking to accept that not everything needs a concrete confirmation, then there is a lot to like about his works. I believe that the author of this fanfic has a really good grasp of Hata's writing style -- which is why this piece flowed so naturally for me. I especially like how Hayate and Nagi converse so naturally with each other here. It's really a continuation of what happened at the end of chapter 568. Even though they had no real contact for two years, when they meet again, the conversation flows so naturally between them. I think that beyond sexual attraction, it's this inherent compatibility in their interactions that will really support their newfound romantic relationship in the long-run. I also love the little hints of tension as the conversation progresses -- but with both of them just a little bit more mature than before and both of them wanting this new relationship that they'd found. In the end, even though they are now romantically together, nothing felt forced. They interacted the way they usually do -- but now with mutual feelings of romantic love between them and with this, that little bit of awkwardness between two teenagers in love. A lovely story and delight to read. Thank you for letting me share this in my blog as well, Roop. It's good to see that it's Hayate who is aggressive here, though it was Nagi throughout the series. Hayate did not remember anything about Athena while kissing, but he did so when Ruka kissed him. It shows how real his feelings are now. As you mentioned the unfulfilled promise of the radical dreamers arc by the stupid question of Hayate and as he loosened the fist of Nagi was amazing. Not to forget how Hayate said that this time Nagi may fire him from his life. I felt some closure was needed regarding radical dreamers arc, which is why I included it here. I think it's necessary to remember that it is not just Athena whom Hayate had met when the former was a kid but Nagi as well. He was grown up at that time but still...Nagi has known him since a long time.